1. Find your format. First things first: choose which format you're going to edit in. I tend to stick with keeping everything on my computer and edit through Microsoft word, but I've also found printing chapters out and editing by hand can help you find a lot of previously unseen mistakes. Some people suggest printing out the manuscript for the first round of edits, but I think you should stick to whatever makes you comfortable. 2. Read through without editing. Take some time to sit down and read through your entire manuscript without making a mark on the page or touching your mouse or delete key. Some may say this is a waste of time or just a pointless extra read, but you know what? You're going to read your book a hundred times anyway. This first read-through with no editing is a good way to mentally prepare yourself and make mental notes, as well as immerse yourself into your story all at once. 3. Sleep it off. After you read through your entire book without making any changes, give yourself a well-deserved break until the next day. This will give your brain a chance to recover, and it will also help keep you from getting sick of your book. 1. One chapter at a time! Don't strain yourself. Take your manuscript chapter by chapter! I personally give myself the goal of tackling one to two chapters a day, but you should adjust that based on your personal schedule. Either way, editing one chapter at a time is a good way to spread out the work, and it also can take away the stresses of attacking your giant word baby. 2. Focus on the big stuff. This is the time to delete big paragraphs, unnecessary scenes or characters, and rewrite chapters. If you find a few small grammar errors or forgotten punctuation marks, go ahead and change them, but don't focus on the small stuff. This first round of editing is your time to delete, rewrite, and repeat. Sound easy? Don't be fooled--this part is definitely time consuming! 3. Back it up. I actually have anxiety about this one, guys. Please, please, please save your original documents and all your new edits on something other than your computer. E-mail it to yourself, put it in the cloud, save it on a stick drive--it doesn't matter! Just have your work saved in more than one place! 1. Take a break! After all that rewriting end deleting, you deserve it. I usually give myself about a week off of editing in between rounds. Focus on another book, take a vacation, read a book, visit the friends and family you've probably been ignoring to edit. Take a break. You've earned it! 2. Prepare for round two! 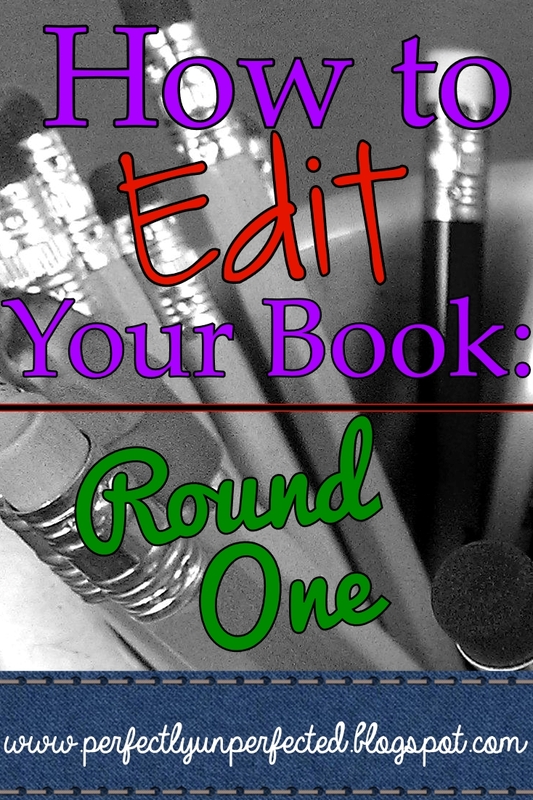 Check back on Thursday where I'll dive right into round two of edits and discuss cutting out words, sentence structure, and more!